Kegel, I, Walker, J, Lomas, M, Jansen, A.J, & Wyver, J. (2017). 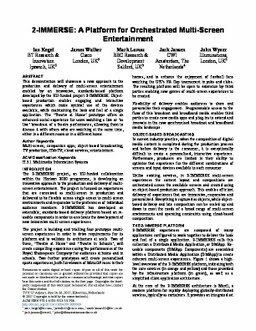 2-Immerse: A Platform for Orchestrated Multi-Screen Entertainment. In Creating and Delivering Shared and Personalised Multi-Screen Broadcast and Broadband Experiences (pp. 71–72).